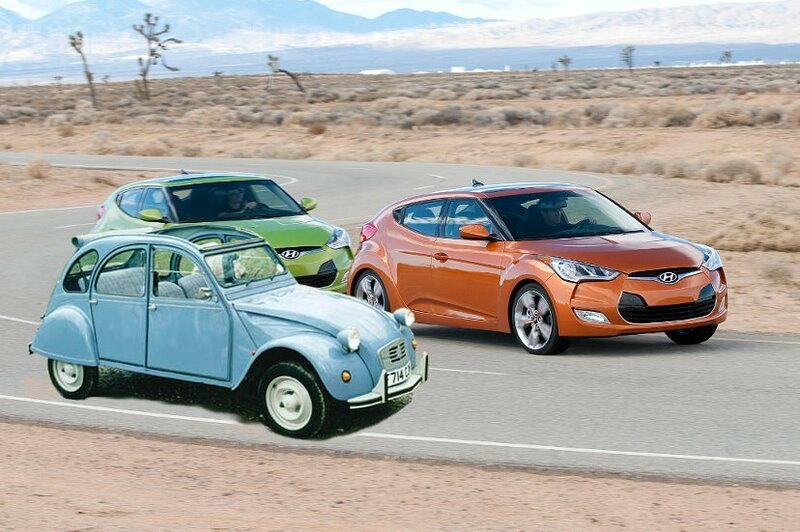 Concerned about media reaction to the performance of the upcoming Veloster Turbo, Hyundai has decided to fit a less-powerful engine to the base-model Veloster in order to widen the performance gap between the two cars. The Veloster Turbo reportedly accelerates to 60 MPH in about 8 seconds, while the normally-aspirated Veloster has been tested in the low-to-mid 9-second range. Hyundai says they plan to have several competing performance cars available to journalists at the Veolster Turbo’s press preview, including a Volkswagen Karmann Ghia, a Fiat 850 Sport Coupe, and a Honda CRX HF with one of the spark plug wires disconnected. Last month, Hyundai’s Ulsan plant began producing Velosters with a de-stroked version of the 1.6 liter Gamma engine. A modified crankshaft reduces displacement to 1.3 liters, dropping horsepower from 138 to 96 and torque from 123 lb-ft to 89 lb-ft. In an exclusive interview with chief engineer Kyu Bong Kim, Autoblopnik asked about the effect on fuel economy, but Kim was unable to tell us because he does not speak English and Hyundai did not provide a translator. Hyundai says that retroactively fitting the modified engines to Velosters already on the road would be cost prohibitive, but they have issued a manditory Technical Service Bulletin that consists of retarding the ignition timing and dropping a couple of balled-up gym socks into the air cleaner box.